As our special gift to you we are offering a free balloon safari in the Masai Mara Game Reserve worth USD410* [terms & conditions apply] on any 7 day or more safari to Kenya covering Masai Mara, for a limited time only. |*Offer available as is; balloon safari activity not exchangeable for cash; traveler must pay full amount for the tour and flights; Africa Safaris offer this promotion of a free balloon safari to any traveler booking a safari that features the Masai Mara Game Reserve in Kenya and pays for it in full as outlined in our terms & conditions; traveler must read & understand our terms and conditions and agree to our disclaimer and terms and conditions prior to booking any services of Africa Safaris; traveler understands and agrees that Africa Safaris reserve the right to cancel this offer at any time Africa Safari deem appropriate. 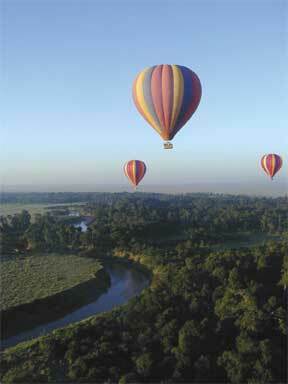 The free balloon safari activity includes an hour’s balloon flight in the Masai Mara Game reserve, a champagne breakfast in the reserve and return transfers by 4x4 vehicle from the camp to the balloon take off site. There is no guaranteed timing for the balloon safari activity as it can be influenced by weather conditions, in the event of which the activity will take place at a later time during the period of guest’s stay at the Reserve, as deemed appropriate by the Balloon pilot. The best time to visit Kenya is between July & August and this is generally the best time for taking a balloon safari, we suggest, for the sake of witnessing the annual wildebeest migration, that your safari dates fall during the course of these two months, to further enhance your safari experience and satisfaction from the activity.